If you look up Kuku in a dictionary it is usually translated as "omelet," which is not an accurate description of this dish. 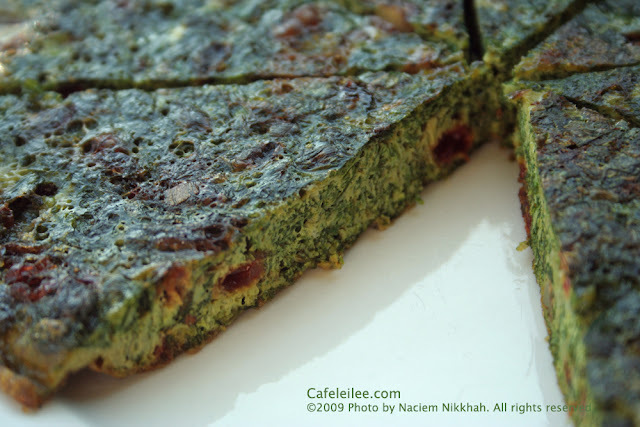 Persian kuku is in fact very similar to the Italian frittata, Spanish tortilla (not to be confused with the bread-like Mexican tortilla), and the Arab eggah. There are different variation of Kukus which contain different vegetables and herbs. Kuku-ye Sabzi is probably the most popular of all, which is served as a side dish on the eve of Persian New Year. Many people like their kuku thick and fluffy, but I personally prefer them thin and crispy. * Tarreh is sometimes translated as garlic chives or Persian leek. They can be found in specialty Persian and Middle Eastern stores. If you can't find them, you can substitute them with green parts of scallions or the green part of leeks. *Barberries are a very tart kind of berry that can be found in specialty Persian and Middle Eastern supermarkets. If you can't find them you can substitue them with cranberries. Break the eggs into a large bowl and whisk thoroughly. Beat the herbs, turmeric, salt, barberries and walnuts into the eggs. Heat oil in a large non stick skillet. While still beating the herb and egg mixture, pour it into the hot (not smoking) oil. Immediately reduce heat, cover and cook for about 20 minutes until it begins to brown around the edge. Turn the kuku over and cook without a lid for another 10-15 minutes. When cooked through, remove immediately from the pan (to prevent unnecessary absorption of fat). Instead of cooking them in a skillet, you can bake them in a pre-heated oven at 375 F. Place in bottom half of oven for 20-30 minutes, then move them to the top half of oven and bake for another 10 minutes. Cut kuku in 8 wedges. You can serve them hot or cold with fresh mixed herbs, lettuce, tomatos and pickled cucumbers wrapped in lavash bread. غذای ایران همراه با غذاهای خیلی کشورهای توی مسیر جاده ابریشم تحت تاثیر فرهنگ های مختلف قرار گرفته. همین کوکو خیلی شبیه هست به فریتاتا ایتالیایی ها یا تورتیلا اسپانیایی ها یا اگاه عرب ها. حالا ایده این شکل غذا اول از کجا اومده را خدا داند. توی یک کاسه بزرگ تخم مرغ ها را بشکنید و خوب هم بزنید. سپس نمک، زردچوبه، سبزی ها و زرشک و گردو خرد شده را اظافه کنید و خوب مخلوط کنید. روغن را توی یک ماهی تابه بزرگ داغ کنید و همینطور كه مخلوط سبزی و تخم مرغ را هم میزنید آن را توی ماهی تابه بریزید. کوکو را توی تمام ماهی تابه پخش کنید و روی آن را صاف کنید. شعله اجاق را کم کنید و در ماهی تابه را بگذارید. کوکو را بعد از حدود ۲۰ دقیقه كه دور آن تقریبا طلایی رنگ شد توی ماهی تابه برگردانید و بگذارید بدون در برای حدود ۱۰ دقیقه دیگر بپزد. وقتی کوکو آماده شد آن را فوری از توی ماهی تابه خارج کنید تا روغن زیادی جذب نکند. کوکو را میتوانید توی فر هم بپزید. در این صورت فر را روی درجی ۳۷۵ فارنهایت گرم کنید و اول بگذارید کوکو روی پنجره پایین فر به مدت ۲۰ تا ۳۰ دقیقه بپزد، بعد آن را به پنجره بالای فر منتقل کنید و بگذارید حدود ۱۰ دقیقه بیشتر بماند. amat mige dastore az nanat migiri? حنا جونم مخلص شما و اون عمه عزیزم هاستم. حتما گارنی یاراخ رو درست میکنم و کامل در موردش توضیح میدم. در ضمن چون سبزی های شمال رو همه بهش دسترسی ندارن نذاشتم.